More than 130,000 Beauty Products Donated… and Counting! 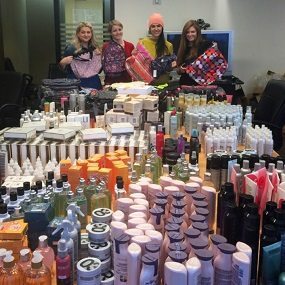 With the goal of putting a bit of sparkle and dignity back into the lives of women and teens in crisis, the Share Your Beauty program taps into the huge surplus of beauty products generated by the beauty industry, by collecting unused products and delivering them to organizations serving women in crisis. Partnering with PrettyConnected.com‘s Lara Eurdolian, Share Your Beauty brings together beauty professionals, bloggers, beauty publications and brands to create “Share Your Beauty” product drives and giving events in the New York City area. The idea behind the effort is to encourage a more sustainable beauty product industry while helping women who are homeless or victims of domestic violence to feel their best. 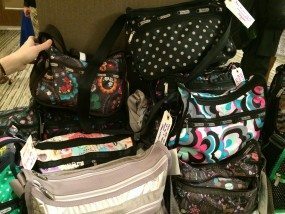 The program receives support from LeSportsac, whose corporate offices serve as a drop-off location for products in New York City. BEAUTY BRANDS: If you’d like to donate a large quantity of products, we’re happy to help! Contact us at shareyourbeauty@family-to-family.org to arrange. Or, if you’re in the New York City area, drop them off! There are two N.Y. area drop-off locations: the Family-to-Family headquarters in Hastings-on-Hudson and the LeSportsac offices in New York’s Times Square. Email us for details and to arrange delivery. New, unopened, unexpired cosmetics, hair and skincare products, nail polish, perfume samples and personal care items. Since our launch in February 2014, more than 130,000 beauty products have been donated to women and teens in need, thanks to the generous support of individuals and members of the beauty industry. Aveeno, bareMinerals, Birchbox, Buxom, Elizabeth Arden, Essence/Cosnova Inc., Henri Bendel, Herbal Essence Shampoo through Pop Sugar, Knock Out Cosmetics, Lilikoi Living, L’Occitane, L’Oreal, Lush, Mario Badescu, Pureology, Redken, Tarte Cosmetics. Please join us and Share Your Beauty!